In February I obtained the papers of AV Paul Milner, who died last year. The papers included some of his father's, Reid Milner, correspondence. The papers included many photographs which I had forgotten. So, for a few months I will put aside the pictures which were sent to me in response to my plea for new pictures for this web site. These pictures will be used soon. The picture on the right is one of the two long-span bridges which I have built. The bridge was not as hard to construct as I thought it would be. Needless to say, no glue was used. 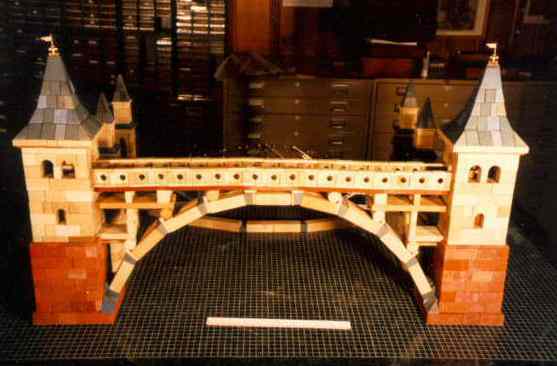 The builder's page shows this bridge under construction. And you will see that the design was not original with me. Bridges of this type were quite a fad among Anchor builders in the early 1920s. Those of you who remember this bridge from 1998 will know that this feature is a "rerun" also. If it is good enough for national television, it is good enough for the Anchor web page. There will be a special exhibition (Sonderausstellung) near Vienna (at the Stadtmuseum of Traiskirchen, Austria). This exhibition runs from March 17, 2006 until December 24, 2006. More than nine months! There is no excuse to miss it! The web site is www.traiskirchen.gv.at, And Vienna is a wonderful city -- well worth a visit even without a special Anker exhibition. I plan to attend, and I hope to schedule my visit around Die Fledermaus, The Magic Flute and at least one Haydn or Mozart mass. Another exhibition opens on February 12th and runs through May 14th. It is in the city museum (Stadtmuseum Hormoldhaus) in Bietigheim-Bissingen 7432, Germany. The long awaited set 24A is now available in the USA. I received only a few 24A sets; more sets 24A sets are on order. If you want one, please send me an e-mail. Two new sets will not available at retail -- either here or in Europe. They can be purchased at the factory only. I bought some and am in the process of bringing them home for sale in the USA. I will be going to the Netherlands this month. I intend to bring home two or three sets of both types (four or five in total). The mosaic set -- 547 stones in four colors -- are intended for floors in Anchor buildings, but both sets are sold and payment is in hand. The set is identical to the set Mosaik Set # 4 from the original factory. 547 stones means that the set is expensive, but Anchor buildings look very nice when they have floors on the porches and entrances. The other set is a Conversion Set (Übergangskasten) from the NF series to the NS series. This set contains all of the special arches and extra stones needed to build the NS designs through set NS 18. The plans are supplied on CD-ROM, not printed out. Since these arches do not fill a box, the factory has added a well thought out selection of filler stones to make a complete box of stones. One of the two sets is still not spoken for. Pricing and availability information is found on the new puzzles and sets page. Send me an e-mail if you want a set. Keep in mind that many more designs (NF 6 through 18) are available on the web in the form of PDF files. Of course they are free; all you need to do is print them out. For those of you who are interested, here is a picture of me and my cats. My picture was taken last year at my 67 birthday party. I am still looking for pictures from other countries. Anchor stones are now popular in Korea, and pictures have been received. So far, I have not received pictures from Asia (other than Korea), Australia or Africa. Since Anchor was popular worldwide, and it still is, there must be some AVs on these continents. You can look at last month's web page. This feature has been available for almost a year, but the link was not well known. Aeropharm is the successor to the Ankerpharm factory in Rudolstadt. The factory is doing well, meeting its business plan, and growing at about 30% a year. (Possible at the beginning, but not over the long run.) It may well happen that factories which trace their histories back to Richter and Anker become (again) the largest employers in Rudolstadt. All sets (including # 24A) and puzzles are now in stock. The prices for all of sets and puzzles is found on the new puzzles and sets page. The last CVA meeting was on Saturday, October 22, 2005. The next meeting date will be on Saturday, April 22, 2006 . I hope you will be there; I intend to attend. See the CVA page for details. The Club of Anchor Friends (CVA) has published a Stone Catalog. I have none left. It seems no more will be printed prior to the completion of the update. To satisfy the demand, the old Stone Catalog has been made available on CD in the PDF format. You can download the 10.2M file. This file has also been added to CD # 6, because that CD has the book and other basic reference information. Should you buy the printed version? It all depends on 1) whether you have European A4 paper (required to keep the scale) and 2) how feel about printing almost 200 double sided pages. The amount of additional work to do continues to grow; the discovery of the original molds has added even more work. I saw one mold which was used to make a stone I had never seen -- not even heard of. That mold was one of a pair -- a corner stone and a rectangular stone. The new factory has made a few samples of each. Of course there was no way to know the correct thickness. Close examination has shown that these stones are a new design for the roof stones of the DS (Dachstein -- roof stone) sets. I obtained samples of the new roof stones at the Ankerfest. I have not really looked at them yet, but I will now that I am home. For more information, you can e-mail me. Remember that the loose leaf format makes it easy to update your catalog. The next update is now scheduled to appear in late 2006 or '07. This revision will be a major update, far larger than thought earlier. Progress is being made. It will probably be as large as the current catalog! A second binder may be needed. This increase in size is not an indication of errors, but an attempt to get as much information as possible in this catalog. Since the catalog uses a loose leaf format, you will need only the new and changed pages. The amount of detailed information in this catalog is very great, and the information keeps coming in. And it has become clear that e-mails with just numbers of stones in a set just will not do; a photocopy or scan (in color if at all possible) of an actual packing plan is required. The CVA is in the process of developing a "Stone Market". As it develops CVA members will be informed, which means not on this web site. The mechanics are complex, so there may be several revisions before its process becomes routine. But the stones are now being kept in Den Haag (Rigolettostraat 28). The factory is planning to put the old molds into production again. Richter's Anchor Stone Building Sets (Richters Anker Steinbaukasten) were the world's most popular construction toy from the early 1880s through W.W.I. These building stones were made in Rudolstadt, Thuringia, Germany, (and at the company's branches in Vienna, New York , but not St. Petersburg, Russia). Starting in 1880, Richter's Anchor building stones were covered by international patents and trademarks. AV Burkhard Schulz, Ellerau (bei Hamburg), Germany, has produced a wonderful video entitled Ankerstadt Rudolstadt. He gave a copy to the CVA Archive, and it is possible he might let you have a copy if you want one. Americans remember: 1) the video is in German and 2) the German TV system is not compatible with the USA TV system. But Burkhard is now offering the video on CD which can be run on almost all computers. Today, there are many collectors and builders using Anchor Stone Building Sets. These collectors often participate in setting up Anchor displays at various exhibitions. The last exhibition was held from September 20 until October 2, 2004, in Jena, Germany, in the Goethe Gallery. A number of Anchor collectors are members of the international Club of Anchor Friends (Club van Ankervrienden), a Dutch club with members from the Netherlands, Belgium, France, Denmark, Chile, Hungary, Germany, Austria, Switzerland, Great Britain and the USA. The meetings of the Club of Anchor Friends is held in the Hotel Lapershoek in Hilversum. Over 600 different Anchor Stone Building Sets were produced in a number of different series. In addition Richter offered other "stone" products such as puzzles and laying games. Information on these building set series is provided here, but one can e-mail me on other Richter products. People who would like to know more about a specific set, including value, or are only interested in additional general information are urged to contact George Hardy. All e-mail questions will be answered, to the extent of my knowledge. Sets and puzzles are being produced again! The quality is high. I urge people interested in starting Anchor building, and those who want to provide their educational benefits to their children, to consider buying new puzzles and sets. Anchor Stone Building Sets are great presents, and the supplement sets make wonderful follow up gifts. These new sets recently won the 1997 Parents' Choice Gold Medal. In 1999, the Anchor sets won the National Parenting Publications Award. For an 1880 toy to win in 1997 and 1999 says a lot about the quality of these sets and Anchor in general. These sets are a perfect supplement to computers. For those who are really interested in Anchor stones, I have written a book about them. (I just got tired of either looking up the same information again and again, or trusting my memory on specific details such as dates and names.) It is expensive, $50 (or 50 Euros, your choice), ppd, because I print it myself on my PC and color ink is expensive. The book undoubtedly contains far more information about Anchor stones and sets, the Richter company, etc. than you'll ever want to read. This book is a lot of work to print (I print about a dozen at a time, in either English or German, and it takes a week, full time. ), so please don't think I am urging you to buy one. The book is also available on CD-ROM, which costs just $2.00. See below. Web Page Notes: Most subpages do not change from month to month. The "builder's page" is revised every month. A few people have asked me to number the "issues" of the Anchor page. Well, they started in August, 1996, (with Vol. 1, # 8, to keep the number of the month the same as the issue's number). The number of this "issue" is shown at the top of this page. All web pages are found in the CD-ROM Archive. See below. CD-ROM Archive: I can supply the CD-ROMs of the CVA's CD-Archive. More scans are being added all of the time, and the "holes" in the documentation are being filled. Of course, more scans means more CDs, and as scans are added some files are moved to another CD. As of today, there are thirteen (13) CD-ROMs in the Archive, plus, for CVA members only, 8 additional CD-ROMs of the old MLBs (including an overview CD-ROM) and 3 CD-ROMs of the AHN (including an overview CD-ROM). (Do not try to buy these MLB CD-ROMs unless you are a CVA member. I check the membership list!) All of the scans are JPG files. # 1 contains the GK-NF building and layer plans, excluding # 34, the Anchor book in PDF format in English, plus odd things like box covers, figures, insets, rulers, etc. ; # 2 contains the DS and # 34 building and layer plans; # 3 contains all packing plans, exhibition buildings, building plans for Imperator (1st Series), and information on other Anchor products; # 4 contains the building and layer plans for the second series of GK-Br and Imperator, the VE series; # 5 contains the KK building and layer plans, plus Comet, Erste Folge, Orion, Eagle, and Imperator (all metal); # 6 contains documentation including my book in both English and German and various magazines (like the Anker Zeitung) and magazine articles, the CVA Stone Catalog, price lists, and information about Rudolstadt; # 7 contains the building and layer plans for the series 100 (Neue Reihe), 200 (Modern [American] House Series), 300 (Landhaus [Country House] sets), 400 (Festungs- und Burgen-Baukasten [fortress and castle sets]), NS, Capital, Täfelchenlegen, Mosaic sets, games, VEB, LaVelle, KMBK (Art Model Building Sets), Eisenbrücken, A-B (American Bridges); # 8 contains the building and layer plans for the series GK-AF, the first series of GK-Br, the VEB era Venice exhibition model, and Richter (includes his will and other documents regarding his estate); # 9 Catalogs, Special Sets, pictures of the original factory (perhaps I will add pictures of the new factory, assuming permission is granted), # 10 Personal Designs, plus advertisements and the German language PDF format version of my book; # 10A more Personal Designs (they won't fit on one CD now), # 11 an overview using PDF and other more modern PC programs and formats, and # 12 additional overview (it won't fit on one CD now) and the web site. Only the members of the Club of Anchor Friends are permitted to purchase the eight CD-ROMs containing all of the MLBs (up through Winter of 2004), including both the English and the German language translations and an overview CD. CDs of the AHN have been added to the Archive. The AHN needs two CDs, plus a third CD for the overview. If you want to buy one or more of these CD-ROMs, please send $2 (or euros, your choice) for the first CD-ROM and $1 each for the rest -- postage included, no matter where they are going. The Euro payments should be sent to the CVA in the usual way that you use. CDs are inexpensive, so I do not see a problem if, at this stage of the Archive, some CDs may become obsolete due to the relocation of files or the addition of more data. The new Anchor factory in Rudolstadt, Germany has added many new designs to its web site (thanks to the help of Burkhardt Schulz). They can be easily downloaded, as they are PDF files. Please note that this home page is revised monthly. Most of the graphics are JPEG, which improves quality and reduces file size. The URL name -- ankerstein.org -- indicates that this site is the official web site of the Club of Anchor Friends. My e-mail address is georgeh@ankerstein.org. Many new graphics, and additional text, are uploaded once a month, as close to the first as possible. I do not change the full set of graphics, as most people never read beyond the first page. If you only have a little time, I urge you to take a look at the "builders" page. And please plan to drop by monthly to see the new pictures. In the restricted space of this web site, I can provide only a limited view of the wonderful world of Richter's Anchor stones. who have created their own designs are invited to send them to AV Burkhard Schulz, Ellerau (bei Hamburg). the puzzle web page is a must for all puzzle collectors, although not much on Anchor puzzles. If you feel that your web site should be included in this list, please let me know. For the month of March, 2006. Anker-Steenbouwdozen, in nederlands (und auf Deutsch). "Anchor" and "Anker" are registered trademarks of the Rudolstädter Anker-Steinbaukasten-Fabrik GmbH & Co. KG. Thank you for visiting the CVA "Anchor" web site.